I wonder if 1962 knew what a special year it would be for music at the time. 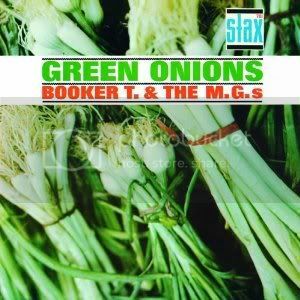 The Beach Boys and The Rolling Stones are commemorating their 50th Anniversary this year and so is another American classic: Booker T. & The MG's Green Onions. Reviewing an iconic album or song is has its challenges, especially when said album and song are celebrating their golden anniversaries. Can I really find a new way to tell you how great this is? What am I going to tell you that you don't already know about this set? I knew the title track from this song before I knew that I knew it, who it recorded it or what it's name was. This is one of those songs that seems like it has always existed. It's in time capsules, it is a time capsule, and it's timeless; it's one of the most important recordings of all time. So, yes, "Green Onions" is an instantly recognizable song, Green Onions, is a vital album and Booker T. Jones' organ is a signature sound in American music. Right. I'm glad we've got that covered. Why are we still talking? Well, there's more to the record than that title track but we fall into the same trap. This 50-year old record has stood the test of time. It's legacy and importance are unassailable. Their take on "I Got A Woman" and "Twist And Shout" are fantastic and I love "Lonely Avenue" and "Comin' Home Baby." Blinded By Sound contributor Kit O'Toole recently highlighted the underrated "Can't Sit Down" in a recent edition of her weekly Deep Soul column (a must read). "Rinky-Dink" is the only track I'm not in love with, due mostly to the greatness of the other cuts on the album. There are some new things to discuss about this 50th Anniversary edition, part of the ongoing Stax Remasters series. Let's start there: the remastering of the record. I don't have pressings of the original vinyl or other CD editions so I can't make a comparison for you but the sound on the CD is excellent. I don't hear obvious signs of too much bass boosting, EQ fiddling, or compression and other antics destroying the sound of modern and vintage recordings. There is still dynamic range and warmth and the music sounds like it was recorded in another era yet doesn't feel dated. In addition to the remastering, we have two bonus tracks tacked on to the end of the record, live versions of "Green Onions" and "Can't Sit Down." The title track is played at a faster clip than on record and it's interesting to hear these songs played live, realizing this band was capable of recreating their magic on stage but they don't reach the level of being essential additions to one's music library. Every music collection should have a copy of Green Onions. It's difficult to convince listeners who already have a copy in theirs to upgrade to this edition. It's not likely this album will ever sound better on CD and that's a point in its favor. The bonus tracks are fine to have but nothing that demands the upgrade. If for some reason you don't have this in your collection, this is the version to get.